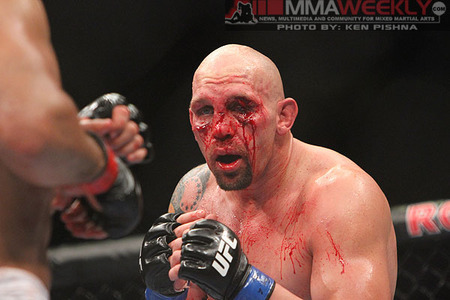 Shane Carwin is home. The Grudge fighter tested himself against one of the very best heavyweights in the world Saturday night and came up short. He has no reason to hang his head though. “As the fight started I just did not feel like myself, I wasn’t able to get my feet moving and Junior capitalized quickly. As he was pummeling me I kept trying to find a way to defend myself so Herb would not stop the fight. Junior was landing solid shots and that is where probably he broke my nose. From that point on the rest of the fight was essentially Junior executing his game plan. His jab was extremely effective and he used the jab to set the pace of the fight. The end of the fight was pretty much a blur. Junior was a better fighter than I was last night. His boxing was better and he used his boxing to take me out of the fight. I have nothing but respect for Junior and his camp. He deserves the title shot. Carwin goes on to say he can not wait to heal up and get back in the gym and start training again. He proved he has the cardio, his heart can not be questioned, he can knock out anyone in the world if he gets in a clean shot — he just needs to work on that technique, mix it up, and stick to his game plan. A lot of fans have mentioned Roy Nelson as a possible next opponent for Carwin, seeing as they are both coming off losses. What say you fight fans?